The toxicology lab examines the response of Tetrahymena cells to a variety of basic substances, looking at both acute lethal toxicity (LD50) and chronic sub-lethal toxicity. 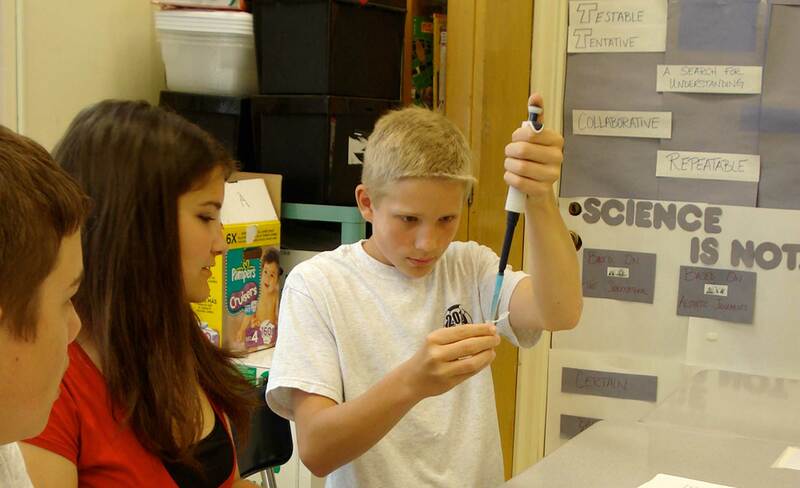 Students can use different concentrations of common substances suggested in the module (for example, shampoo, detergents, toothpaste, Windex) to determine lethal and sub-lethal dosage, or, under teacher supervision, design their own experiment to look at common substances of interest to them. The lab offers an opportunity for students at all levels to begin to address experimental design, the effect of experimental variables, and potential long term environmental impact of even commonly used items. Arregui L, Serrano S, Linares M, Perez-Uz B, Guinea A. 2007. Ciliate contributions to bioaggregation: laboratory assays with axenic cultures of Tetrahymena thermophila. Int.Microbiol. 10 (2):91-96. Noever DA, Matsos HC, Cronise RJ, Looger LL, Relwani RA, Johnson JU. 1994. Computerized in vitro test for chemical toxicity based on Tetrahymena swimming patterns. Chemosphere 29 (6):1373-1384. Pauli W and Berger S. 1997. Toxicological comparisons of Tetrahymena species, end points and growth media: supplementary investigations to the pilot ring test. Chemosphere 35 (5):1043-152. Povyakel‚Äô L, Boltina I, Krivenchuk V, Zhmyn‚Äôko O. 2010. The analysis of the hazard of polluting a marine area with oil products for the natural environment and population. J. Water Chem. Technol. 32 (2):127-130. Rogerson Andrew and Berger Jacques. 1982. Ultrastructural Modification of the Ciliate Protozoan, Colpidium colpoda, Following Chronic Exposure to Partially Degraded Crude Oil. Trans.Am.Microsc.Soc. 101 (1):pp. 27-35. Sauvant MP, Pepin D, Piccinni E. 1999. Tetrahymena pyriformis: a tool for toxicological studies. A review. Chemosphere 38 (7):1631-169. Schultz TW, Dumont JN, Kyte LM. 1978. Cytotoxicity of synthetic fuel products on Tetrahymena pyriformis. II. Shale oil retort water. J.Protozool. 25 (4):502-509. Silverman J and Pennisi S. 1987. Evaluation of tetrahymena thermophila as an in vitro alternative to ocular irritation studies in rabbits. Cutaneous and Ocular Toxicology 6 (1):33-42. Slabbert JL and Morgan WSG. 1982. A bioassay technique using tetrahymena pyriformis for the rapid assessment of toxicants in water. Water Res. 16 (5):517-523. Werlin R, Priester JH, Mielke RE, Kramer S, Jackson S, Stoimenov PK, Stucky GD, Cherr GN, Orias E, Holden PA. 2011. Biomagnification of cadmium selenide quantum dots in a simple experimental microbial food chain. Nat.Nanotechnol 6 (1):65-71. ASSET protocols by ASSET Outreach Program are licensed under a Creative Commons Attribution-NonCommercial-NoDerivatives 4.0 International License.